Just about every day you’ll see a car going down the road with a dog’s head sticking out of the window. Here's everything you need to know about keeping your dog safe on car rides like using doggie goggles to protect your dog’s eyes! Here’s everything else you need to know. 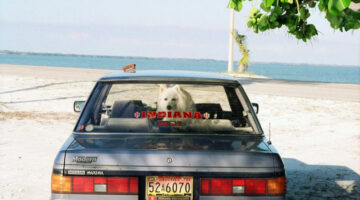 Dogmobiles: An up-to-date list of the best cars for dog owners. 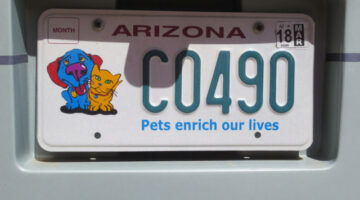 Plus some things that you should look for in a vehicle that your dog will be riding in. Just about every day you’ll see a car going down the road with a dog’s head sticking out of the window. My dogs do it too. With all the bugs, dirt, and debris flying through the air, imagine the damage if your poor dog should get hit in the eye by something. Doggie sunglasses (or doggie goggles) can be quite useful when it comes to protecting your dog’s eyes! Here’s what you need to know. 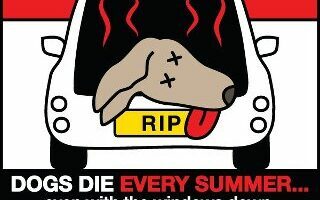 Please don’t leave your dog in the car on a warm day — even if the windows are rolled down! And if you happen to see that someone has left their dog inside a hot car, here’s what you should do. 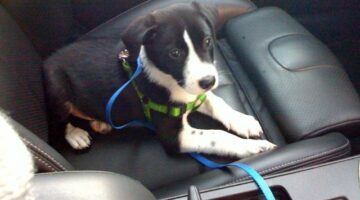 Dog hot car laws aren’t clear, but these tips will help! Ever had your dog fall out of the car window? We have! So we’re giving away 2 products to help keep your dog safe and comfortable while riding in the car. Should Driving With A Dog On Your Lap Or Unrestrained In Your Car Be Against The Law? One of the best things we ever did to make car rides even MORE enjoyable for our dogs was to get them ‘doggie chin rests’. Here, Destin is showing us how much he likes his Comfort Cruiser. Anyone For A Jeep Ride? Dogs love Jeeps… here’s proof! One of the BEST things we ever bought for our dogs was a doggie chin rest called a ‘Comfort Cruiser’. It’s soft and squishy, and reminds me of those ‘noodles’ kids play with in swimming pools, yet softer. Here’s why the Comfort Cruiser is so great when you’re riding in the car with your dog. We got our dog a doggie chin rest called a ‘Comfort Cruiser’. It reminds me of those noodles that you play with in a swimming pool… only this is a bit softer. 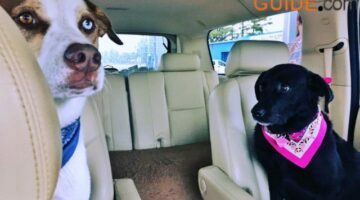 Here’s why the Comfort Cruiser is so great when you’re riding in the car with your dog.